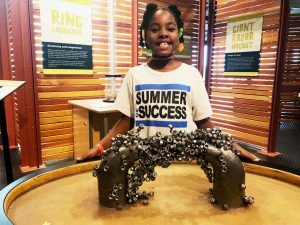 Summer of Success is a unique combination of workshops, activities, and trips to encourage their curiosity and personal growth. The program consists of a daily health and fitness course, workshops focused on building skills in literacy, creative writing, and college readiness. Students will also participate in daily enrichment ranging from art, dance, karate, and music. There will also be weekly field trips and a daily lunch and snack will be provided. 1. Completed application and essay response. 2. A copy of the student's most recent report card, demonstrating a minimum 3.0 GPA (or an additional essay explaining any circumstances that contributed to a GPA below 3.0). The completed application, including required additional documents, must be submitted to S.A.Y. Detroit Play Center (19320 Van Dyke, Detroit, MI 48234) in person or by email to Jenell Mansfield at jmansfield@sayplay.org by JUNE 19. A mandatory parent orientation will be held in July before the program begins.